When I first moved to the Village, in the late 1970s, it was very different from now. Union Square, a block away from my apartment, was a creep-infested hellhole you wouldn’t set foot in even in daylight. The now famous Greenmarket was just starting, a few truckloads of old hippies selling sprouts and cat grass. My apartment was burglarized four times in one year, the streets smelled like marinating garbage. It was a ton of fun. CBGB and the Mudd Club were in full bloom, and I certainly took advantage of that. My buddies and I spent a lot of time roaming the streets looking for cheap restaurants. John’s Italian on 12th Street was one we’d go to a lot. Allen Ginsberg lived across the street from it, and he was always milling around. That was a plus. The place opened in 1908, and the inside remains unchanged even today, with beautiful multicolor tiled floors and murals of Tuscan cypresses and Mediterranean villas. The food at John’s was never great, pretty standard red sauce stuff, but we’d go for the romance and the funk of it. They had big Chianti bottles overflowing with wax from the candles stuck in them. They were a bit disgusting and dirty but sort of fabulous, too (and they’re still there, though reined in and tidied up). If back then I ordered an eggplant parmigiano with a side of spaghetti and a glass of red house swill, I was safe and happy. John’s was one of the only affordable Italian games in town. Now you can’t walk a block in the East Village without coming across three good to great Italian places, all with more contemporary food and prices just as reasonable as John’s. But John’s endured. I went in about a dozen years ago just for old time’s sake. The food was exactly the same (not so good), the décor the same (good), but the place was almost empty. I couldn’t blame my neighbors for going instead to the cute Sicilian brick oven place around the corner that had house-made mozzarella, freshly grilled sardines with orange salad, and great nero d’Avola for six bucks a glass. That one last visit got me over the need ever to eat at John’s again. Or so I thought. I happened to walk past good old John’s the other night and noticed a change. The gorgeous red neon sign was still lit and spectacular as ever, but the awning lettering had changed. What had for years said simply “Italian Restaurant”now read “Traditional & Vegan Italian Restaurant.” Vegan Italian? What is going on here? I marched in. No apparent change in the atmosphere, thank God, but I grabbed a menu and there it was, the insert, an addition to their usual, a complete Italian vegan listing, including seitan Parmigiano, ravioli with vegan Alfredo, and chocolate soy cannolis. Oh, what are you guys thinking? I supposed their business had become so precarious they were taking a tip from Angelica, the always packed vegetarian place next door. A last-ditch attempt to stay afloat. Wow, how sad, was all I could think. I’m not vegan, but I eat a lot of vegetables, and I have a high regard for vegetarian cooking. Vegan really only works well when you tailor it to a basically nondairy cuisine, as they do at Angelica’s, where most of the stuff has an Asian feel. There they don’t need to substitute that much. The food can just be. But Italian? Parmigiano, mozzarella? What could possibly replace those classic tastes? The perversity of it all captivated me. I had to try it. So I grabbed my sister, the only person I knew who might be game, to eat vegan Italian at John’s. The place was fairly busy, but a quick glance at the tables told me that almost everyone was ordering off the traditional menu. Plates of veal Marsala, chicken parm, and spaghetti with meatballs were everywhere and looked just as they had in the seventies. Then two twenty-something girls came in, sat next to us, and grabbed the vegan menus. They were excited. I asked how the vegan food was. “Excellent. I eat here all the time. The ravioli is to die for.” Really? Both of them ordered the vegan Alfredo ravioli, big green lumps, as it turned out, covered with a creamy whitish sauce. One of them let me taste a bit of the sauce. It tasted like soy milk (something I had sampled exactly once). 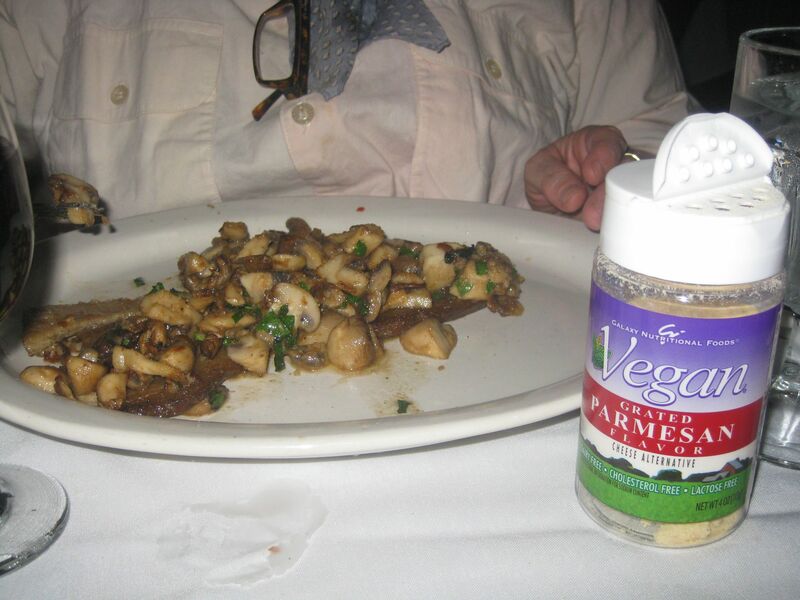 A shaker of vegan parmigiano was brought to their table, which I also tasted. The flavor was not remotely cheese-like, more like a mix of wood chips and MSG. It was truly odd. I couldn’t imagine wanting to put it in my mouth, but the girls were in heaven, oohing and ahing. They ate really fast. Then their chocolate tofu cannoli came out, and they screamed with joy. It looked liked a dried-out doggy doodie. I don’t know whether is was the three rum-and-cokes they each consumed or what, but this food was the living end for them. To each her own, I suppose, but Southern Italian cooking is my passion, and it really pained me to see it messed with that way. Seitan Marsala with a shaker of vegan Parmagiano. But on to our meal. There was a vegan Caesar salad I wanted to try, but it scared my sister. She assumed it would be loaded with garlic and the same vegan Alfredo sauce that covered the ravioli (and what’s a Caesar without anchovies? ), so we scratched that idea and started with the stuffed mushrooms instead. For a main, my sister ordered seitan Marsala only after I promised to pay for her entire meal (this dish we couldn’t help calling Satan’s marsala). It had an odd bitter sweetness that hit you at the back of the throat, almost as if it contained a sugar substitute, and it seemed to completely lack salt or pepper (as did the girls’ ravioli). Its liquidy brown sauce didn’t taste like Marsala, but I was told it contained it. And the seitan slab was covered with extremely soggy mushrooms. Soggy seems to be the prevailing texture with the vegan menu. There was traditional food that looked like it had been properly roasted, but all the vegan stuff seemed to be steamed. Like the eggplant parmigiano I ordered, a heavily breaded dish so mushy and gummy it dissolved in my mouth in an unpleasant way (I mean, it wasn’t supposed to be a soufflé). That was especially disappointing because the dish looked relatively normal, with its stringy melted “cheese” topping. I discovered that the “cheese” was made by Daiya, a Canadian company. It melted well, but it had no flavor at all. I don’t mean no particular flavor; I mean literally no flavor. I looked up the company, and all they make is vegan cheese substitutes. They’ve actually won awards. Well, I suppose if you’re desperate for a cheese substitute. Wikipedia tells me that the main ingredients in the Daiya product used on my eggplant are arrowroot, cassava powder, and titanium dioxide (yes, the same white stuff that’s in your sunblock, but a version of it used as a food dye—how vegan). Our stuffed mushrooms were filled with breadcrumbs and I think some of that Daiya cheese, but they had the same mushy consistency as the eggplant dish. The traditional eggplant parm and stuffed mushrooms I saw on other people’s plates didn’t look steamed. They were browned and seemed to have some texture. They had obviously been baked. Just because a dish is vegan, does that mean it can’t have texture or seasoning? Vegans, to my knowledge, aren’t opposed to ovens. They just don’t like to eat animals and their byproducts. As I see it, the moral of this story is, if you insist on eating vegan, don’t make it Italian. Go with a cuisine that lends itself more naturally to vegan, like veggie Japanese. Or if you somehow must have Italian, pick dishes that are naturally vegan, such as orecchietti with broccoli rabe, garlic, chilies and pine nuts, and forget about the cheese, or make yourself grilled eggplant with a salsa verde using great olive oil and Sicilian capers and fresh mint. If Allen Ginsberg were alive today and still living across the street, I can’t imagine he’d eat that stuff, and he actually was a vegan (or was he macrobiotic?). I think he’d head over to Angelica’s instead, and try to preserve his dignity. We also put titanium oxide in concrete – to make it self-cleaning. No joke. The stuff’s amazing – but I wouldn’t eat it on a dare. Thanks for doing the hard lifting here, should I ever find myself tempted to order vegan Italian. Weekends around here are pretty much vegetarian, owing to the influence of the present girlfriend, who’s into that kind of thing – and we pretty much stick to Indian seasonings. Why reinvent the wheel, right? Yes, Indian is right on. And there were other things that sounded bad in that ‘cheese’, aside from the titanium oxide. For instance, what are ‘vegan flavorings’ I wonder? Such a great article, Erica. It’s funny, beautifully biased reportage and so damn accurate re: vegan fare in general…it’s all mush of one sort or another that tastes like styrofoam, packing peanuts. My daughter is rabid vegan and she’s foisted this on us. We go along obligingly but every meal we take with her leaves me sighing for some food with more soul…and more animal by-products. Thanks Michael. And yes, I am having trouble getting my memoir recipe book published. It’s a hard market out there and it seems if you’re not a celebrity cook it’s doubly hard (cult figures, like me, evidently don’t count). But I’m still working it. Yikes! Sounds more like ravioli to die _from_. But you are one hilarious (and fabulous) writer. Well done — unlike the vegan slop at John’s, evidently. Thank you Girl of Steel. I wonder if you’re steely enough to tackle this strange Italian food? 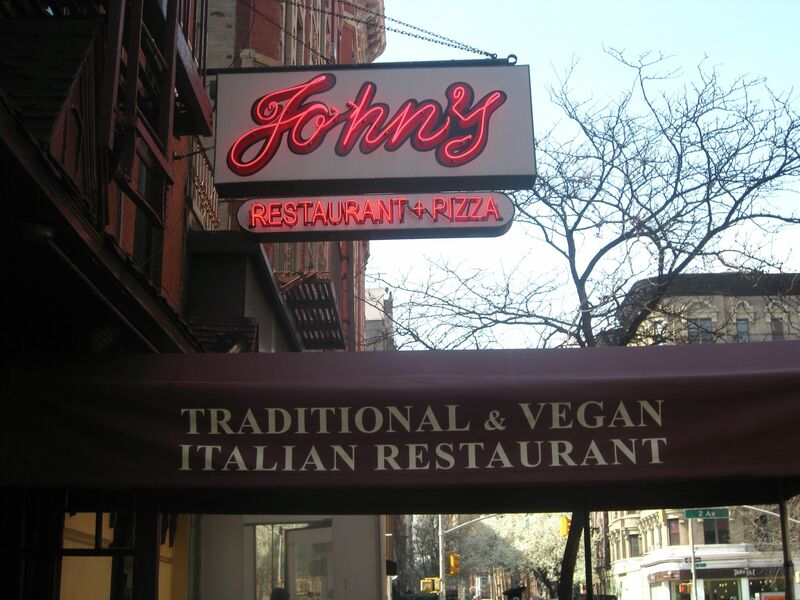 “I grabbed my sister, the only person I knew who might be game, to eat vegan Italian at John’s” and “my sister ordered seitan Marsala only after I promised to pay for her entire meal” really made me smile. My sister is the first one I grab when it’s time for an adventure. I love that you paid for her meal. Yes, there’s no getting around it, sometimes sisters must be bribed. You are a wonderful writer, not a bit stuffy or uppity like some food writers. I would buy your food memoirs in a Philadelphia second, and I’d grab one for my sister too. This is the first thing I read this morning and I’m so glad I did. You rock, Erica! Thank you so much. That was a really nice note. And I’ll let you know how I’m progressing with my memoir. It will, I have no doubt, eventually find a good home. That was truly a cringe-worthy post. I used to live a few blocks away and my brother worked as a waiter there for a few years. I would stop by sometimes when the staff was having their meal before service and they would always invite me to join them. The food for the staff, at least, was pretty good – not grandma quality, but good. Eating off the menu there was really a forgettable experience if not for the candles. I remember hearing of people who went there thinking it was John’s Pizza in the West Village (purportedly the greatest pizza in Manhattan) and being really disappointed. I have tried a vegan lifestyle and may return to it one day, but you are so right — vegan and Italian are like water and oil. Actually, water and a good olive oil would taste better than vegan parmesan and seitan with anything. It’s been more than 20 years since I lived in the East Village, but IMHO, if we’re talkin’ Italian, there was nothing better than a Vesteddi sandwich at Vinnie’s Focacceria on 1st Ave and 12th St.(?) Have you ever experienced it? I remember that there was a steam table pan, in the front of the house, filled with olive oil and garlic cloves, natch, and a big old calf’s spleen with chunks of ricotta salata bathing in the oil/garlic/spleeny mix. If memory serves, you’d order the sandwich, they’d slice the spleen, add some of the ricotta salata and shredded cheese (I remember Gruyere, but it might have been Caciocavallo) on a round Sicilian semolina sesame seed bun. Dang, that was a tasty sangweech. OK, vegans, try to replicate that! NIce of you not to let Liti pay for that gruel! You’re a good sister. Looking forward to your memoir book. Great memories. Thanks. And I do remember the Vesteddi sandwich at Vinnie’s. The only place left I know of that makes them is Ferdinando’s in Carroll Gardens. Or you could take a nice trip to Palermo, of course. You may have wondered why this post didn’t prompt a comment from me, your essentially vegan pal. The horifying notion of John’s vegan menu stunned me to silence. Nothing clever nor critical came to mind at all. This seems so wrong and desperate. What revolting dishes ! Pinzimonio springs to mind as a worthy item to get on a vegan menu, as well as bean soups, all kinds of pasta and salads. . Not seitan or sawdust cheeze. Catering so clumsily to the vegan fad is so sad. On the other hand, you must take a crack at writing a vegan mobster tale – thanks to Liti for the brilliant idea. Marieta, In retrospect the food was even worse than I conveyed. You would have been horrified, especially since, as you point out, Italian, even tons of stuff John’s already had on their menu (orecchiette with brocoli rabe and garlic for instance) is vegan. This was just a pathetic parade of chemicals. Gorgeous day here in stinky old Manhattan. Just planted red geraniums. Fumio ate one in the process. All sorts of vogue-ing going on across the street. Tomorrow I’m planting borage and nasturtutim on my balcony. Fumio is welcome to saunter on by for the kill. Got my hands on some cavolo nero seeds. Let’s see how they fare in the planters. I hear it’s not a fussy plant-and so gorgeous. I’m on a mission to enlighten the french on all things kale. Only once have I seen it here in the last 10 years. Kale is very trendy now in Manhattan. You see it baked or fried and crumbled as a garnish on soups, or as a side to a steak. I also love the little bags of crunchy baked kale they sell at health food stores. To make it, I think you just dry the leaves, brush them with olive oil, sprinkle with sea salt and stick them in a hot oven. They come out sort of like a potato chip but much deeper in flavor. I’m going to try this and let you know how it comes out. Good luck with your balcony garden. Cavolo Nero does seem easy to grow. My friend barbara had tons of upstate last year. Good for Ribollita, which I love. Very funny, very sad. Faux food is just that. Don’t know if you ever tried making the kale chips, but given how they shrink down, you will want a very large oven to get much before you give up. Oh, and the kale scorches easily, so go slow especially toward the end. I understand a dehydrator works well if you have/have access to one.